As a homeowner, you’re always looking for ways to improve your home. In addition to investing in future home improvement services such as vinyl siding installations and gutter guards, you need to ensure that everything you currently have is protected and well-maintained. 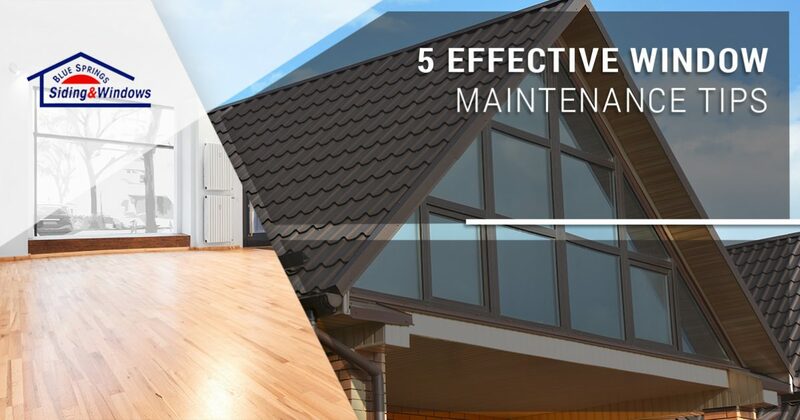 In today’s post, we’ll provide you with five effective tips that will help you keep your windows in pristine condition for years to come. Blue Springs Siding and Windows proudly provides window installations for residents in Kansas City and the surrounding areas. We carry the best replacement windows in the industry, and our talented window contractors are dedicated to ensuring that you’re completely satisfied with the final outcome. Get started with a window installation estimate through this page, and read on to learn how you can prolong the lifespan of your windows! Regular cleaning is your first line of defense against damage from dust and dirt. You’ll want to use a damp microfiber cloth that has been thoroughly rung, as you don’t want to risk mold growth by using too much water. Windows with vinyl and aluminum should be washed with a mild detergent and a soft sponge or brush, and you can clean the window pane itself with any glass-approved cleaner. In addition to cleaning the pane and the surrounding frame, be sure to thoroughly clean the inside of the casing to prevent jams from occurring in the future. If you’re going to spend time cleaning your windows, then you may as well inspect them at the same time! As you surely know, the weather here in Kansas City and the nearby areas can change quickly and drastically. High-speed winds, hail, and other harsh weather conditions can damage your windows, so be sure to periodically check for chips, cracks, moisture, and signs of rot. Do you feel a draft? Gaps in your windows allow the outside to come right in, compromising your home’s energy efficiency and causing you to pay more each month for heating and cooling. If you see any holes or cracks in a window’s caulk, or if a rubber seal is beginning to degrade, then be sure to replace and/or recaulk the area. There are some cases in which holes and cracks may not be readily visible, though they are still taking a toll on your home’s thermal retention. If you suspect that this is occurring in your home, then try the candle test. Light a small candle and slowly move it around the perimeter of the window while your HVAC system is off. If the flame flickers in a certain area, then the window has a small hole or crack. Windows are so much more than functional components of your home. They play an important aesthetic role as well, and they can often make or break your property’s curb appeal. Much like your entry door, your home’s windows are one of the first things that both guests and passersby will notice. Plan to update windows with wooden and metal frames with a new coat of paint every three to four years, making sure that you don’t accidentally paint over moving parts. The last thing you need is a beautiful window that won’t open! Every window has a lifespan. While many windows will function decently for years on end, you will almost certainly find yourself surprised by how much of a difference new windows make. From the clarity of the panes to the insulating capabilities of today’s latest models, you won’t regret choosing to invest in a window installation. You can view all of our windows at our showroom in Blue Springs, or you can visit this page to read more about each model we offer! We know that it can be difficult to determine if you should repair or replace a window, and our helpful staff is here to answer any questions you have about your home. We hope that today’s entry will help you maintain your windows throughout the year. Keep an eye on our blog page, as we’ll continue to update you with even more tips and helpful resources as the year goes on. Get in touch with us through the form below for a free window installation estimate!